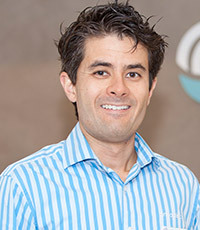 Dr David Madsen is a registered specialist orthodontist with the Dental Board of Australia. His qualifications include a Bachelor of Dental Surgery with First Class Honours from the University of Sydney and a Doctorate of Clinical Dentistry in Orthodontics from the University of Adelaide. He also holds memberships with the Royal Australasian College of Dental Surgeons, Royal College of Surgeons Edinburgh & is also a Fellow of the World Federation of Orthodontists. Dr Madsen brings with him the very latest orthodontic techniques to this practice including direct and indirect bonded braces (clear and coloured), Invisalign, lingual orthodontics (braces placed on the inside) & temporary anchorage devices (to extend the envelope of treatment options available to you). Dr Madsen is also at the forefront of research and education in the field of Orthodontics. He has published research in the esteemed European Journal of Orthodontics and held Associate Lecturer and visiting Senior Lecturer positions at the University of Sydney & Queensland respectively.